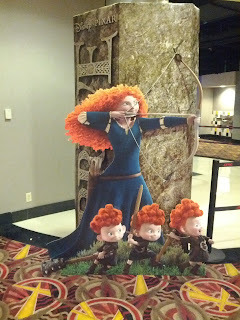 I saw Brave on Friday for a friend's birthday, and here are some thoughts. I saw it in 2D. Since most movies I've seen in the last year were in 3D, it seemed weird watching it in 2D, as though some element was missing. But, as I've observed when it comes to watching movies in 3D or 2D, on small screens or large, in high definition or not, I stop noticing the visual difference after about 5 minutes. In 3D movies, I remind myself to appreciate the extra dimension by periodically removing my glasses and then putting them back on. The movie has a strong feminist theme to it and deals with sexism and cultural tradition. There are a few scenes and lines in the film addressing this that feel clichéd, and at one moment it felt as though the film was "Look at us! We're so innovative with our rebellious heroine!" The relationship between the female lead (Princess Merida) and her mother (Elinor) caters to a bit of a stereotype too, and it's relentless problem-making made it the dynamic feel a bit shallow: like it must be immutable because it's an important plot device. But I don't care. It's great. What feels clichéd to me will prove fundamental and novel to younger people. I want something a bit richer and deeper than what I've already seen a dozen times before, this is a beautiful first time for someone else, and I want it anyway. The context they put daughter and mother into also does a great deal to redeem the static first act of their relationship: it's funny watching the mother deal with it, and it's awkward watching the daughter handle her mother (though she doesn't seem to take it as seriously as I would expect any child to :D). Also, best of all, she doesn't fall in love with anything but her freedom! Perhaps there are other Disney films already featuring that. I don't know. It's a nice contrast to the complicated relationship brewing in The Legend of Korra. So, overall, I like Merida. A key point is her self-determination. She wants to control her own fate and not let it be dictated by expectations or tradition or family. As a guy, I'm glad her father King Fergus isn't the antagonist to her ambitions, but I understand the problem of casting mothers regularly as the problem. Often it is men who create conditions that challenge women, and I've seen that in places I work. Still, hooray for Fergus being a liberal oaf. I like the hobbies she's taken up in particular: horseback, archery, exercise in nature, argument. I will probably give up my aspirations of becoming a decent horseback rider (unless I could one day justify affording my own stable and care for a horse that could meet my standards), but I love the concept of having a symbiotic relationship with a large animal that binds you in physical endeavours. I used to practise archery when I was in elementary and high school (never amounted to much except meeting one of my best friends) in reflection of Link, my hero. I'm currently physically active and trying to embed myself as deeply into nature as my current situation and obligations allow. I also enjoy her willingness to stand up for herself and not silently brood. It's not only a dignity/pride matter, but also one of adequately communicating yourself and giving other people, like her mother Elinor, the best opportunity to understand how she feels. She also has red hair, a weakness of mine since I was 16 and a family trait (I should carry one recessive gene for it), and is Gaelic. The setting is wonderful. I tried really hard to devour and remember the various landscapes they showed at the start, most/all of which come up again later in the story. The landscapes there have a little in common with my beloved New Zealand. The castles and keys and rocky cliffs and glens and forests and hooray. More pleasing to me than any cityscape could be. That makes it hard for me to incorporate any one into my identity, and different ones thrive at different points. During my teens, Gaelic culture was rich, thanks to some forgotten television series about a clan of Celts roaming the highlands, thanks to Arthurian legend's connections to it, thanks to Gargoyles, thanks to the forests around my home and druids in random shows. It's never really left, as I still enjoy its music, and I even used to wear a beloved ring with a Celtic design on it on loan from a friend. One thing I enjoy about Celtic/Gaelic culture is its pagan spiritualism. I enjoy the relatively loose structure and minimalist nature around cults (for certain value of minimalist). In Excalibur Merlin comments that the old gods are gone, making way for the One God of man. Later, after he himself leaves, he's brought back by Arthur's love, which led me to the thought that woodland spirits require interaction to exist and little more. (I have a concept of general religion that tries to accommodate multiple perspectives from competing religions to magically justify everything: ask me about it sometime!) So, I enjoy the Will-o-wisps in the film, I enjoy the witchcraft (more traditional than Celtic in origin), I enjoy the relationship of the kingdom to an animal, the bear. One thing I actually don't enjoy is the relationship of the kingdom to their animal, the bear. I mean, I like the concept of it, but I don't like how it's practised. There's almost no respect shown for the bears despite it being on their family crest. I know there's bitterness over Fergus's lost leg, but their solution is to KILL ALL THE BEARS. Contrast that to the Starks in Game of Thrones adopting Dire Wolves as pets due to their connection to the family sigil. I also hoped a little that someone would use the universal advice of going "Whoa bear, whoa" when encountering a bear and backing off. I used to think that was specific to a place in Algonquin but I've since discovered that it's a common piece of advice, oft derided, even present in U.S. Department of Agriculture publications. I also like the plot device of a potentially irreversible transformation based on a regrettable, naïve desire. I like the moment near the end when the sun is rising and it seems like it's too late and she just doesn't know what's wanted of her to reverse the transformation and it just breaks her heart. I liked that my heart broke with hers at the idea of her mother being irreparably transformed into a bear without a trace of her human self any more. Dwelling on it even now breaks my heart again and again. There's also some decent humour. 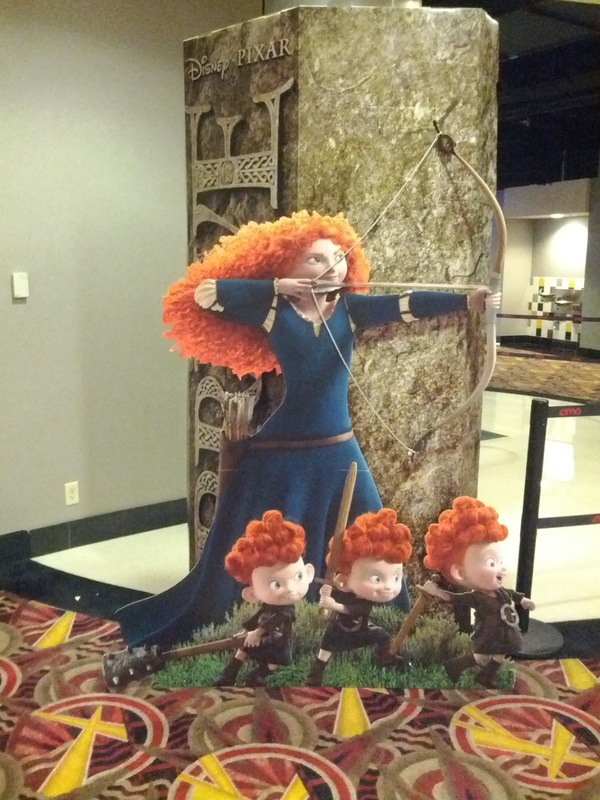 Merida's three younger brothers are delightful. There addiction to sweets is delightful. Their conniving is delightful. There bear antics and adorable teddy-bear appearance is so incredibly delightful. I don't think I actually laughed that much during the film, which is fine, but the scene after the credits when Merida's order of ALL THE BEAR WOOD WORKS had me cackling, and made me regret that my friends attending it with me had not remained for the credits. Speaking of the credits, while watching them I could at least say I wasn't just waiting for the potential surprise after as the soundtrack and the pieces playing during the credits were awesome. It was easy to close my eyes and imagine an orchestra in front of me. It makes paying $14 for the tickets at AMC seem all the more worth while when you consider you get a nice concert out of the deal as well. I look forward to a sequel with a grand adventure for Merida. If you've seen Brave, what are your thoughts?